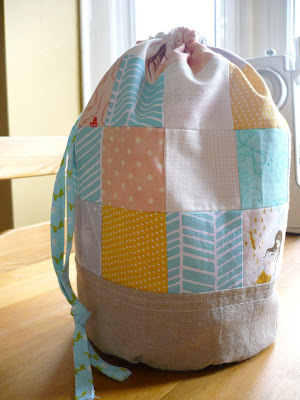 Miss Print: A Little Sewing and a Little Knitting + the Giveaway Winner! 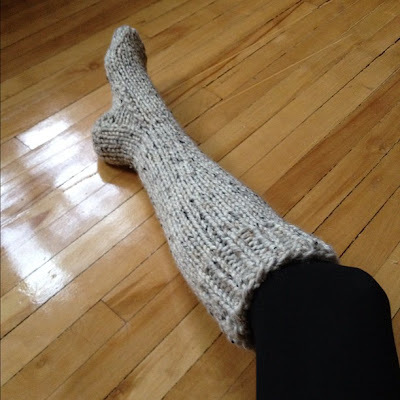 A Little Sewing and a Little Knitting + the Giveaway Winner! I had this past week off from work (annual holiday that I had to take before the end of this month) and since we weren't going away anywhere I spent much of this week at home. I fully intended to sew and craft everyday to my heart's content but that really didn't happen (procrastinate much? ); instead I watched Downton Abbey, some movies, went out for coffee with a friend, went thrifting, read four books, and only actually did a little sewing on Thursday. But I did make something fun! I saw Tamiko's tutorial for this sock knitting bag on her blog and decided that I just had to make it (and pin it) because it was so pretty! Now let me preface this by saying that I had not actually ever knit socks before making this bag, but I just loved it so much, and really wanted to try making a round bottomed bag so I went for it! All of the fabrics used (except for the lining) came from my scrap bin. The 40 squares that make up the patchwork exterior include some Heather Ross Mendocino, Joel Dewberry Modern Meadow, Patty Young Flora & Fauna, Basic Grey, City Weekend by Oliver + S (that white dot on yellow is one of my favourite fabrics ever), Sandi Henderson Meadowsweet, and a few others. 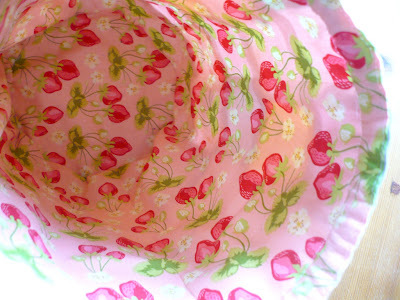 The lining fabric is also from Sandi Henderson's Meadowsweet collection. I did a few things differently than in the tutorial; I didn't hand stitch around the linen like in the tutorial but rather did two lines of top stitching in white thread. Instead of sewing my lining and exterior pieces together at the top while they were inside out (and then pulling them through a hole in the lining and sewing it up afterwards) I just turned everything right side out, turned the edges under a quarter of an inch, pressed, and top stitched everything closed. I also made my own draw string by basically making double-fold binding (strip cut at 1.5") and then top stitching along the open ends. I can't remember what collection the fabric I used is from but I think it's Lecien. Ohhhh pretty! And because I know someone is going to ask - the yarn is Madelinetosh Tosh Merino Light in Tern which I bought online at Eat, Sleep, Knit. 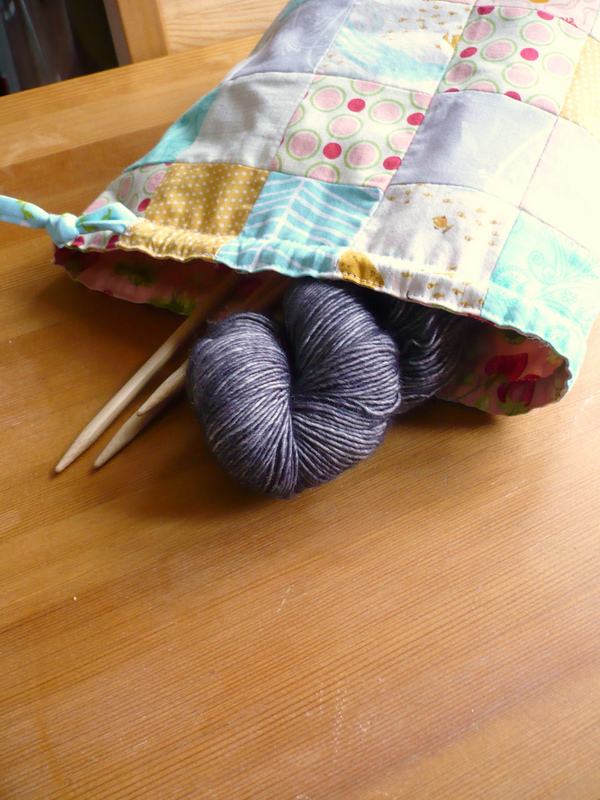 And then, just because I made a sock knitting bag, I did in fact knit a sock - it was magic I tell you! I've actually had this yarn and pattern sitting around for about 2.5-3 years but hadn't started them, however with my new sock bag in hand it seemed inevitable and so I did. This first sock was started on Friday night while watching Who Do You Think You Are, Grimm, and When Harry Met Sally with Alex and was finished on Saturday morning while watching The Young Victoria. The second one is on the needles now and I'll tell you more about the pattern, etc when I have the full pair! Woohoo, congratulations Heidi! 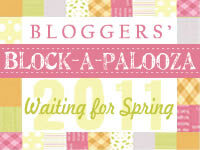 Please send me an email so that I can send you your extra-special FQS gift certificate code. Thanks guys for playing along and I hope that you've all taken the chance to check out Craftsy's Block of the Month series. What a cute little bag! Thanks for the link to the tutorial. 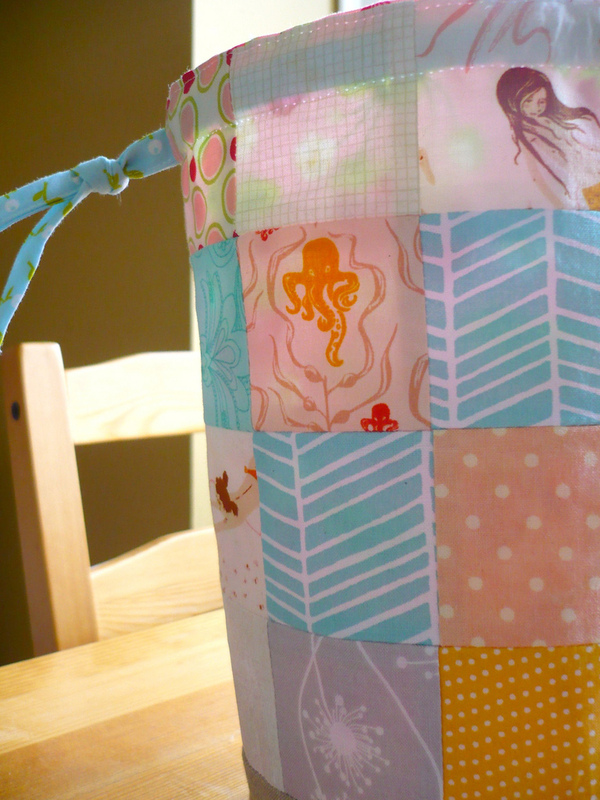 Can you believe I've never made myself a sock knitting bag? Great work on your sock too! It looks super cozy! Now I want to make a sock knitting bag AND learn to knit socks! I love relaxing weekends! The bag is super adorable and the sock looks nice and cozy! I sent an email to you, but wanted to also leave a comment just in case. 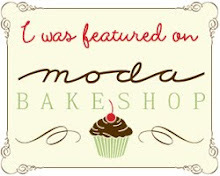 I was SO excited to be the winner of your $25 giveaway certificate to Fat Quarter Shop. You can reach me at hjstaples@gmail.com. Thanks for making my day!! We must have been watching the same shows on Friday and Saturday! Only I was crocheting a cardigan... I was thinking about that same sock bag, but have not quite got that far yet, perhaps in a few days as yours has turned out so perfectly! Do you purchase your natural linen online? I've had a hard time finding it locally. Yes, I purchase all of my linen online. This specific linen was made by Moda but unfortunately the shop I was buying it from switched to a different brand and I haven't been able to find this anywhere else (I'm thinking they don't make it anymore). I have bought other linen from various stores online since, but haven't found anything I like quite as much as this (although the Essex linen-cotton blend made by Kaufman is quite lovely). I would recommend taking a look at Rashida Coleman-Hale's book "I Love Patchwork" as it has a list of linen sources. I have not bought from any of them (that I recall) but I trust Rashida's advice on this one!